Organizing for Action’s efforts on behalf of legislation in New York state may fall under that state’s definition of lobbying, requiring registering with the state and the disclosure of activities, according to campaign finance experts. OFA, the nonprofit formed out of President Barack Obama's successful campaign, recently joined with two other New York lobbying groups, the Public Campaign Action Fund and Citizens Action of New York, to push for New York public election financing and other legislation championed by Democratic Attorney General Eric Schneiderman. Organizing for Action hired former Obama campaign hand Kate Stevens to lead the New York effort. On a conference call Wednesday night, Stevens said OFA would be hosting house parties and educational forums in the coming weeks to help promote these policy proposals. But attorneys told the Free Beacon that OFA’s efforts in New York may fall under the state’s broad definition of lobbying. "In New York, if you engage in any sort of a call to action on the part of government, whether you do it directly … or you do it indirectly … that’s lobbying," said one New York- based attorney who specializes in state lobbying law. "If Organizing for Action either hires someone or has an in-house person and their expenses exceed $5,000, then they’re obliged to register under New York state law." D. Mark Renaud, a partner at Wiley Rein LLP and an expert in local lobbying law, said he could not comment on OFA specifically. But he did say that, in general, "someone in-house would have to register as a lobbyist if they received more than $5,000 in a calendar year for lobbying activities in the state." Grassroots lobbying is also covered under the law, Renaud added. An OFA official said the organization has filed the necessary paperwork. "In New York, our online grassroots communications in support of fair elections in New York require us to file disclosure reports, and OFA has filed all proper paperwork to meet those requirements and give our supporters the ability to push this important legislation to reduce special interest influence in that state," an OFA official told the Washington Free Beacon. 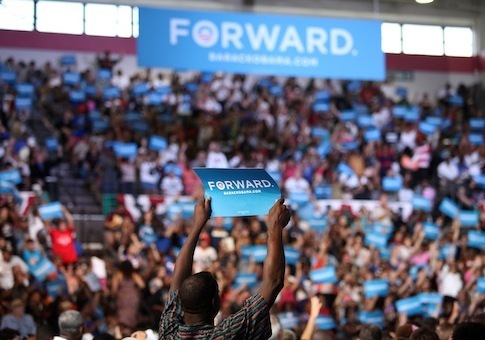 "OFA has always been about empowering people to get involved in the political process, and we said from day one that if there is a local issue that aligns with our ideals and our supporters on the ground want to be involved, then we will engage," added the official. OFA does not currently appear in the database of registered New York lobbyists. OFA director Jon Carson called the election finance reform campaign a "historic opportunity" for the organization to help "give New Yorkers the campaign finance system they want and deserve," during the conference call with New York Attorney General Schneiderman organized by OFA on Wednesday night. "[T]hey are fed up with the status quo, and they know it’s time to do it right, so we here at OFA are going to provide the support and give them this platform to be a part of it," said Carson. Schneiderman, who has been working to enact stricter campaign finance laws, said OFA could be instrumental in helping to get his policy proposals passed. "It is a winning issue in New York right now, and we need your help to make sure that we close," said Schneiderman. "We’re not asking you to be starting pitchers. But you can be [Yankees closer] Mariano Rivera if you come in right now and help us get it done." Organizing for Action has taken a hard-line approach against lobbyists in the past, and has said it will not accept contributions from federally registered lobbyists. Still, the group has actively courted six and seven-figure donations from industry leaders. This entry was posted in Politics and tagged Democratic Donors, New York, Obama Campaign, OFA. Bookmark the permalink.